Students will be guided through several hand-building techniques in order to make creatures real or unreal! We will pay lots of attention to gesture, movement and personality, practically bringing our sculptures to life. Participants can expect to complete 4-5 pieces during this 6-week class. Refunds will not be given within one week of the start of a class. Classes are not pro-rated, and there are no makeups for missed classes. A $25 processing fee is withheld from all refunds. The Art Center reserves the right to cancel any class or workshop due to insufficient enrollment, in which case tuition will be fully refunded. If Falmouth Public Schools are closed due to weather conditions, we will be closed and the missed classes will be rescheduled. Fee includes 25 pounds of clay, glaze and firing fee. A tool kit may be purchased for $14. Open studio time, which is scheduled several times throughout the week, is available at no extra charge. Ellen Blomgren is a professional ceramic artist specializing in narrative, animal sculpture. Ellen is exceptionally talented with sculpted dog portraits and is able to capture the very personalities of each pet. Mrs. Blomgren owns Mudstone Studios, a collaborative ceramics studio in Warren RI. Mudstone is a very active space with learning and sharing of ideas. She has also been instrumental in the opening and operations of two artist cooperatives in RI, Made in Warren and Hotpoint Emporium. 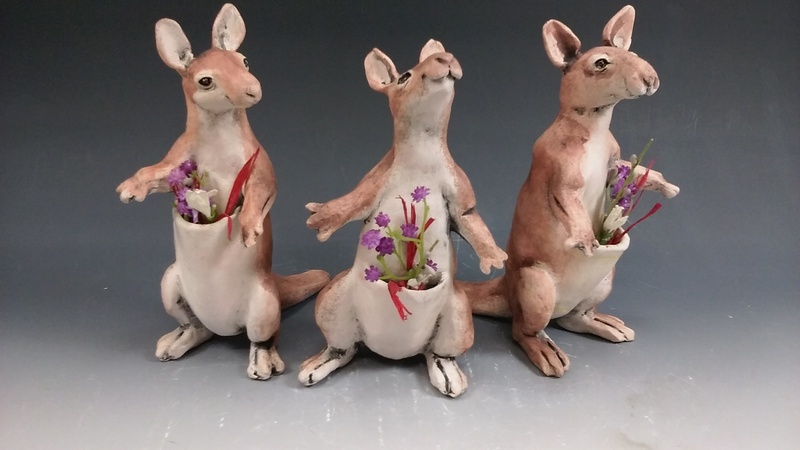 An Artist Educator on the RISCA roster since 2002, Ellen integrates education in the creation of ceramic art. She guides students through the planning, forming and glazing processes. Public installations include Rhode Island Hospital, Woodlawn Community Center Pawtucket RI and over a dozen schools throughout RI. Recent venues of Ellen’s personal works include Deblois Gallery Newport RI, Van Vessim Gallery at Sandywoods in Tiverton, 30 Cutler Street Gallery and Imago Gallery Warren, RI. Bristol Art Museum.